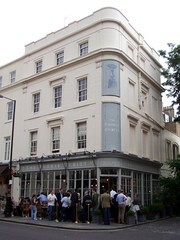 A very pleasant gastropub in Belgravia, not far from [Victoria Coach Station]? but inhabiting a quite different world. It bills itself as a public house and dining room, but you may find yourself pushed towards eating by the presence of napkins and cutlery on all the tables, even downstairs by the bar. However, drinking on its own is still fine and clearly popular, going by the crowds to be found outside the front door on weekday evenings. There is a separate upstairs dining room with a different and much pricier menu from the bar downstairs. The bar itself is large, with tables on either side of it, in two separate rooms joined by a thin corridor. Tables are solid and wooden, though can be a bit rickety. On an August 2008 lunchtime visit, Ewan and Jo ate downstairs and had the vegetarian burger (£9.50), which was small given the price, but very tasty and extremely well presented, with a small bucket of well-cooked crispy fries photo. Service was friendly and accommodating. There are two real ales on handpump, Deuchars IPA and Adnam's Bitter, as well as familiar lager options and an excellent wine list as one might expect. A large glass of pinot grigio came in at around £6 and was good quality. This place clearly gets very busy, and even on a Saturday lunchtime was largely full, but even at the Belgravia prices is well worthwhile if you're in the area and hungry. Last visited by Ewan and Jo, 9 August 2008. Opening hours taken from Time Out website, August 2008. Last edited 2013-05-10 08:09:08 (version 6; diff). List all versions. Page last edited 2013-05-10 08:09:08 (version 6).